Dr. Lorri Tomko was one of the first dental practitioners in the area to offer same day dentistry using the CEREC system, and she has used this system since 1999. With years of experience, Dr. Tomko offers a superior level restoration with CEREC crowns, bridges, and other restorations. 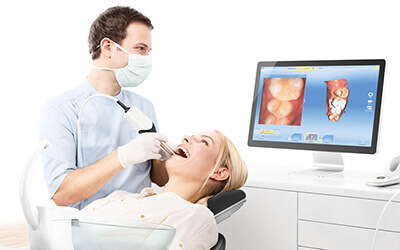 If you’re interested in finding out more about CEREC, keep reading or contact Tomko Dental Associates. CEREC literally stands for Chairside Economical Restoration of Esthetic Ceramics. That means CEREC is an in-office restoration system that allows our team to complete the entire dental crown process in just one appointment using computer assisted design and manufacture (CAD/CAM). Rather than waiting for a custom restoration from a dental lab, the CEREC system mills the restoration right in our office for optimal patient convenience. Traditional dental crowns are placed over the course of two visits. During the first appointment, we prepare the tooth, capture bite impressions, and place a temporary crown. We send the bite impressions to a dental lab where the custom crown is made, and patients return to our office to exchange the temporary for their custom restoration. The entire process typically takes two or more weeks to complete. CEREC condenses this process into a single visit by cutting out the need for a dental lab. Instead, digital impressions are immediately transferred to an in-office milling unit where the custom crown is crafted from a single block of ceramic. Patients with damaged teeth leave our office with a flawless smile in just one appointment. What are the Benefits of CEREC Restoration?